This is Bill. Bill is the smartest guy out there. He has become Internet famous. Bill has his own book now. Reading it will make you laugh and become smart too. 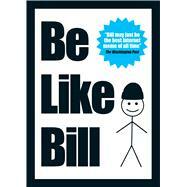 Buy this book and be like Bill. Be Like Bill is not only the biggest internet sensation of our time, but he’s also the smartest. He understands what it takes to remain polite and civil in a world where people think it’s ok to post photos of themselves sporting a silly duck face on Instagram, that not using their turn signals while driving is acceptable, and that spending more time on their smartphones than they do with their partners is totally fine. Bill has observed a lot of things about the modern world and through his Facebook page (OfficialBLB) he’s been showing his millions of fans how they might like to reconsider some of their behavior. And now, he’s brought his very best and funniest memes together in this pocket-sized guide to modern life – much of which has never been seen before. Eugeniu Croitoru is a 24-year-old currently based in Milan, Italy. He manages several popular Facebook pages, including the Be Like Bill page (OfficialBLB). His dream is to become an "internet entrepreneur." Debabrata Nath is a 26-year-old from Guwahati, India who has been a geek all his life. He manages the Be Like Bill Facebook page, and is the co-founder of one of the biggest gaming media sites in the world: Fraghero (www.fraghero.com).